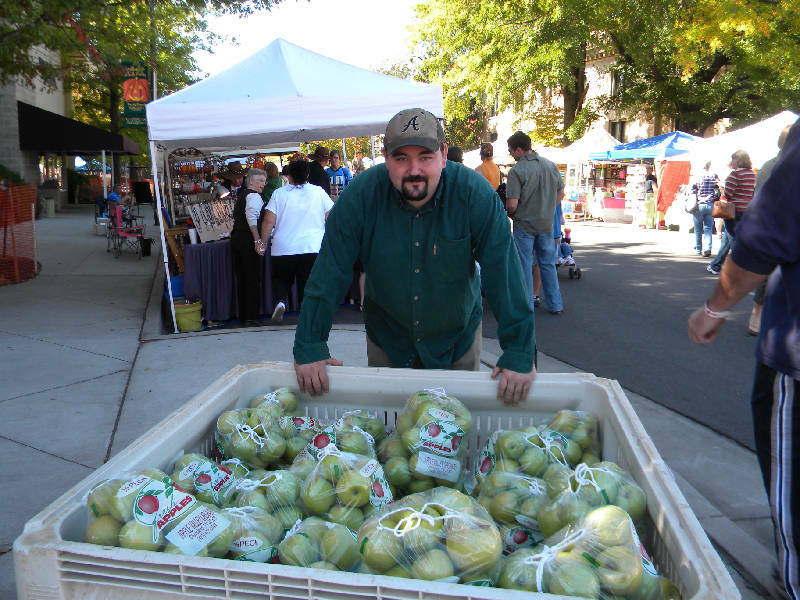 Marc Cresswell, of Apple Valley Orchard, sold a variety of apples at the 2010 Apple Festival in Cleveland, Tenn. It's nearly apple time again. Autumn is the season to get Ginger Gold with a Pink Lady or Red Free with Granny Smith. Apple eating goes quickly. Apple growing, however, takes patience. Chuck McSpadden, owner of Apple Valley Orchard in Cleveland, Tenn., said apples ripen over a period of time, and each variety has its own timing. A Gala will ripen early, while a Pink Lady is a later apple. The later varieties tend to keep better, he said. While it is possible to grow an apple tree from seed, the only way to guarantee a variety is to plant from a graft attached to a root stock, essentially the beginnings of a tree, which are then planted and grown. Planting from seeds, he said, doesn't always guarantee a particular type of apple -- which creates the risk of growing apples that aren't particularly tasty. The keys to growing apples successfully are patience, protection, plucking. Then, enjoy picking. 1) Be patient. Apple trees have the best lives when the fruit doesn't actually grow in fully for three years. McSpadden said he plucks the blossoms the first two years before the fruit forms. 2) Protect the trunk from pests. Put a guard around the base of the tree to protect it from rabbits and mice. 3) Protect the tree from grass. Grass will take necessary nutrients out of the soil and away from the tree, he said. Rodents also prefer to be in the grass. 4) Plant trees in the late fall, preferably, around November, but even planting in February is acceptable. 5) Be aware of which apples are appropriate for the climate. McIntosh apples, he said, don't grow well in the South.